Offering toughness, durability, superior design, and a great fit and finish. These racks have proven themselves worthy by our own brutal testing and by thousands of adventure riders all over the world. They are the finest racks available at any price. Made in Germany from heavy gage black powder coated 5/8" (16mm) round steel tubing. Featuring maximum attach points per side and a rear cross bar for ultimate strength. The "Lock-It" 1/4-Turn Fastener feature allows you to quickly remove the main parts of the rack for those days you want just the clean un-accessorized looks of your bike. Only a few small plates are left behind when the racks are removed. 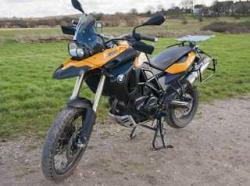 NOTE: Does not fit F800GS Adventure model. If your bike came with BMW Vario side case mounts there will be an interference with the passenger grab rail bar that runs under the seat. To remedy this problem, you can replace the Vario passenger grab rails with regular grab rails available from BMW, or you must shave off some material from the plastic fins on the bottom of the seat. The Vario mount grab rails are identified by the threaded lugs sticking outward.